At present the 2019 Silverstone British Grand Prix will be the last race after Silverstone triggered a break clause in their contract. Tickets for the 2019 British Grand Prix are via limited providers. Many of the official ticket resellers are not promoting tickets for the 2019 Grand Prix at this time. So for the latest availability please visit Silverstone website direct. 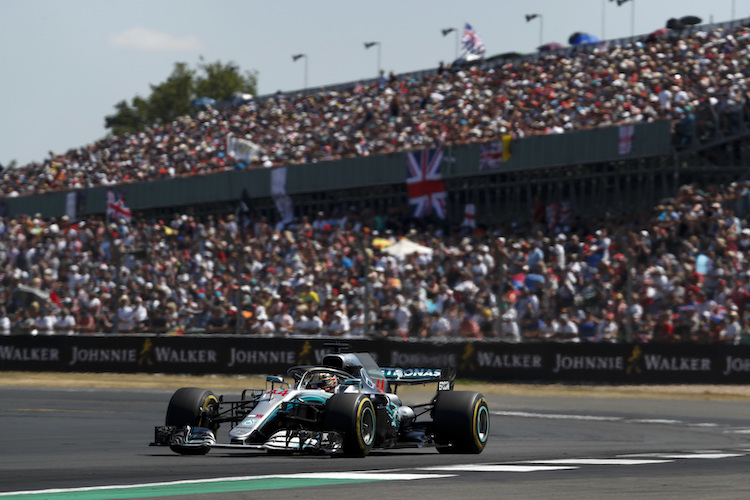 For 2019 Silverstone are offering Fasttrack tickets for an extra £30 (Sunday via a designated FastTrack lane allowing fans to access the circuit quicker, and earlier than before. – Access to the circuit 30 minutes earlier than advertised opening times over the 3 days (Friday to Sunday. – Get to your favourite viewing spot before it gets busy! The T1 Enclosure is located behind Abbey Grandstand and provide an exclusive covered area. There are dedicated bars, street food vendor and areas to relax with screens showing the action on the tracks. Entertainment is also provided throughout the grand prix weekend. You will have an allocated seat for the 3 days in the Abbey Grandstand. It’s also possible to rove around the other grandstands. We’ve been offered a number of passes for access to the F1 Paddock Club on the Friday of the BGP weekend. Although these aren’t cheap they are considerably cheaper than Saturday and Sunday access (£3,451). The price is £625 plus VAT and includes..
– All day hospitality, including gourmet buffet luncheon. Please contact us if you would like further information or would like to book. Silverstone have a number of entertainment activities arranged for across the weekend including Razorlight on Friday night, Craig David on the Saturday night and SOUL II SOUL on Sunday. Timings will be released closer to the event. 3 day (Friday to Sunday) general admission tickets allow roving access to available grandstands on a Friday. Adult 3 day tickets are £190 and children between 11 – 15 are £99. Great news for families with Children under 10! For 2019 General Admission tickets for Children under 10 can go free of charge. These include Vala and Village A. Prices for 3 day stand tickets including roving on Friday and Saturday are £260. These include Stowe, Copse and National Straight. Prices for a 3 ticket are £320 for an adult and £160 for children between 11 – 15. These include Club, Luffield, The View, Village B and Woodcote. Prices for 3 day tickets for 2019 are £340 for an adult ticket. Abbey and Becketts have been classified as Platinum for 2019. Prices for a 3 day adult ticket are £375. Club corner and International Pit Straight are the only stands classed as Platinum Plus. Not surprising for Club Corner which is normally one of the first stands to sell out. Prices for a 3 day adult ticket are £450. Access to Thursday’s pit walk is not included with any tickets. However, closer to the time of the race, 3 day ticket holders will automatically be entered into a ballot for a chance to win pit walk passes. There’s always a great range of packages available at Silverstone. Packages are available for all 3 days or you can book Sunday only. Prices start around the £1,000 mark for Sunday but drop us an email (click here) and we’ll let you know what’s available. A number of teams are running their own packages for 2019. Drop us a line if you’re interested in spending a day with one of the tops teams, such as Red Bull, Force India, Williams or Mercedes AMG. We’ll be updating the site with latest offers and discounts. We’ll also be updating our ‘Where to sit guide‘ based on the experiences of our site users. I’m coming over from Australia next June and am a keen F1 fan. I was just wondering how much will the cheapest grandstand seat be for just the day of the race? Also the cheapest grandstand seat give you a decent view? The cheapest grandstands are £199 but it’s got to be worth spending a little more to get a descent view!! How about Becketts for £249? I would like to take my nine year old to watch the 2016 F1 British Grand Prix at Silverstone. He has always wanted to watch this race. What is the cheapest entry fee for the both of us and what part of the track would we watch it from? What are the car park arrangements and is there a cost? Hi Dave, Children aged 10 years and under are entitled to free General Admission entry. So you’d be looking at £185 for a Sunday General Admission ticket or £195 for the weekend. (ticket resellers can be found here). Take a look at our where to sit guide for more information on some of the best spots. You can book parking by clicking here. Also, what is a sensible time to arrive AND leave on Saturday and Sunday? Don’t want to get snarled up too much in traffic but don’t want to be there at the crack of dawn! Any advice/help is much appreciated! Hi Scott, Your plans to go to Silverstone Village and walk in sounds like a good one to me, 15 minutes should be fine to get your to the National Straight. It might be worth checking with a local Taxi company as they will be more familiar with the best drop and pick up points, maybe silverstonetaxi.co.uk. As far as timing Sunday is clearly busier than Saturday so I’d recommend an earlier start. If you have Grandstand tickets there’s less of a worry on timings. Hi, I have just booked tickets and parking for the 2016 F1 race day but need to collect the tickets from the ticket collection office. This will be my first time at any F1 and I was wondering how to get to the ticket collection office and whether it would be worth me coming on Saturday to collect the tickets rather than wait while Sunday, when things are going to be extremely busy. Hi Paul, Saturday is likely to be very busy too. If you’ve got Grandstand tickets obviously you have no worries about taking your seats. The gates open at 6 and the car parks open 30 minutes before that. Head for the main entrance for tickets. Hi Jeff, Check out our where to sit guide on Silverstone to help find the best place to sit. For tips on parking check out our ‘Parking at Silverstone‘page. I hope that helps, but let us know if you need any further assistance. Thanks Paul. I’m told that if you go just for the Saturday it’s just General Admission tickets. is there an option to sit in a grandstand. My wife and I arrive in London on 15 July 2017. Can we get stand tickets for race day only? What is the price range? How do we get from the City to the circuit? Yes no problem with tickets for Sunday only. Please take a look at the following page and check out the re-sellers .. The best way by train is to go from London Euston to Milton Keynes (30 minutes) where there’s a free coach transfer to Silverstone. Hi, I am looking to purchase tickets for my partner as a surprise for the 2017 British GP F1…It will be our first time so looking for advice please. I have read the general admission tickets are good for being able to roam etc, could you let me know the start/finish times etc so I can work out travel prior to…fair drive so need to work out when to stay. Also we will just be coming for the one day, would you recommend the main race day of Sunday rather than qualifying? If you could please email me this info I would really appreciate it. Also it’s showing two dates 9th and 16th? Could you confirm the correct date please…. Hi Lucy, The track opens from 6am and there’s not normally a mad rush for the circuit to close after the race as many fans hang around and enjoy the entertainment on stage. General admission is a good choice but there is no reserved space, so you will need to arrive early to make your way to your favourite viewing area. Qualifying is a good day and includes some good support races but, you can’t beat the experience of a race day. Hi just wondering how much tickets would be for the Saturday and Sunday and where is the best option to stay over the night?. Hi Lucy, You can compare ticket prices with a number of the main ticket re-sellers from this page.. https://www.enterf1.com/f1-tickets/british-f1-grand-prix-tickets. There’s a number of options depending on how much you’re looking to spend. Have you considered camping? Another option worth looking at is the Snooze Pod. Hi I was looking to buy tickets as a surprise for my husbands 40th but wanted to do the pit line access also, do you do tickets for this on top of tickets for the weekend, would love to do the pit lane access on race day. Could anyone tell me is there entertainment etc going on into the evenings after the days racing is over? I was going to book camping tickets for woodlands as theres so muxh going on there but he has a lot of injuries from being in service and don’t think he’d do well for whole wk3nd in a tent, he’d be fine if we did glamping but would need to book it before new year and its going to be approx £800-£1000 which i haven’t got at minute. There will be entertainment but the schedule has not be announced yet. Another option for accommodation could be Snoozebox. Hi Caroline, That’s correct it’s not possible to buy Saturday only tickets. The options are Sunday only, Friday to Sunday and Thursday to Sunday. Hi Christine, It really depends on your budget. General admission for Sunday is £159 and Grandstands start from £245.